PageProof integrates with over 750 webapps using zapier.com. For an introduction to how PageProof works with Zapier, please read this article first. In PageProof, in your main menu click team, then integrations, then manage zaps. These triggers can be connected to an Asana action using Zapier. When a trigger is sent to Zapier, you can optionally use a filter to help make decisions about your action. PageProof sends everything it knows about a proof with every trigger. 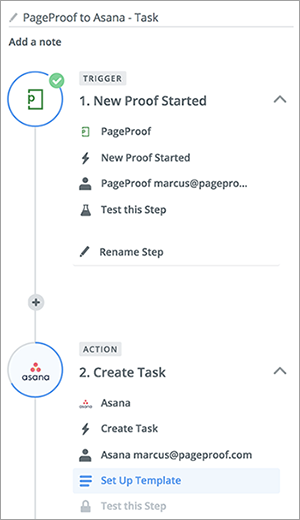 To create a zap, go to the PageProof zapbook (with your Zapier account logged in) where you can choose the already created Asana zap, or click on Make a Zap! to start a new zap from scratch. Note: You can add a filter inbetween the trigger and action if you need to. You can also add additional actions.